Accommodate both bikes and scooters with the double sided Campus Rack. Similar to the single sided model, offering exceptional support, orderly parking and superior security the double sided model staggers bikes on both sides of the cross support beam for greater capacity and space efficiency. The innovative, staggered rectangular hanging lock-bars or 'ears' add a bold aesthetic, that is universally compatible with all types of bike locks. MIG welded for durability and longevity, the commercial Campus Rack is available in a galvanized or powder-coating finish. 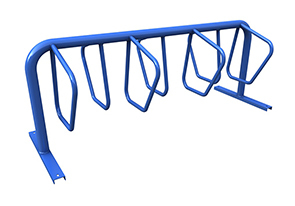 Capable of holding in total 6-12 bikes or scooters, the all-steel double sided Campus Rack is great for transit centers, universities, parks or business parks.